(by Marisa Schultz, NY Post) – WASHINGTON – The Senate confirmed Betsy DeVos as Education Secretary Tuesday with a historic tie-breaking vote by Vice President Mike Pence. All 48 Democrats plus two Republicans – Senators Susan Collins of Maine and Lisa Murkowski of Alaska—comprised the 50 votes against the Michigan school-choice advocate. Pence joined the remaining 50 Republicans to give DeVos the 51 votes she needed to get the position. It was the first time in history a vice president cast a tie-breaking vote for a Cabinet nominee. The DeVos vote was the tightest vote in history and was filled with drama up until the final minute. Pence arrived at the Capitol around 11:30 am and waited in the wings. Voting kicked off shortly after noon as the clerk ticked off the names of each of the senators, who trickled into the chamber. At 12:28 pm, the vote was tied 50 to 50. Pence walked in at 12:29 pm and took the head seat– his first time serving as president of the Senate. He gaveled in and read from a sheet of paper handed him by a Senate clerk. Democrats spent the last 24 hours trying to persuade one more Republican to defect. “People across the country saw a nominee who was clearly ill-informed and confused, who gave a number of very concerning responses to serious and reasonable questions, in that hearing. Betsy DeVos refused to rule out slashing investments in or privatizing public schools,’ said Sen. Patty Murray (D-Wash.) said in a final plea before the vote. But Republicans believe DeVos – a longtime GOP donor and school choice advocate – is just the person needed to disrupt the system and return control of schools to local districts. The vote was so tight that the Attorney General confirmation of Sen. Jeff Sessions (R-Ala.) was delayed until after he fulfilled one more duty as senator — casting his vote for DeVos. Immediately after the DeVos vote, Pence left the Senate chamber, the Senate invoked cloture on the [Jeff] Sessions nomination [for Attorney General] — 52-47—clearing the way for a final vote on his nomination later this week. Much like his boss, Pence took to Twitter immediately after the dramatic vote. “Today’s vote to confirm Education Secretary @BetsyDeVos was a vote for every child having a chance at a world-class education,” Pence tweeted. President Trump opted for comment on his official White House account. “Congratulations to our new Education Secretary, @BetsyDeVos!,” Trump tweeted from the @POTUS account. [On Feb. 1, the Post reported: DeVos, a former chairwoman of the Michigan Republican Party and mega ­donor to the GOP, has been a longtime champion of charter schools and private-school vouchers. In 2010 she launched the American Federation of Children, a leading school-choice advocacy group. "What makes Mrs. DeVos seem so threatening to the teachers’ unions and their political allies?" 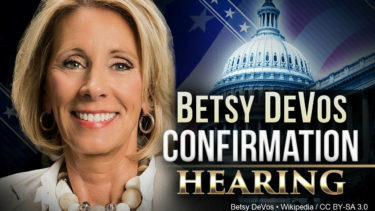 Watch Betsy DeVos' Senate confirmation hearing at c-span.org.